HYDERABAD: Famous sculptor Ganapathi Sthapathi, who had carved the world’s tallest monolithic statue of Buddha and installed it in Hussian Sagar in Hyderabad, breathed his last on Friday. 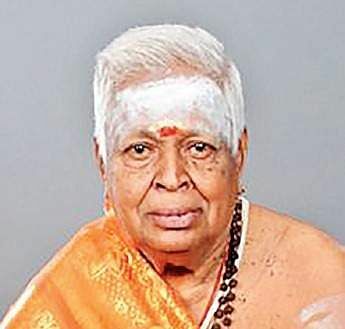 According to sources, Sattanatha Muthaiya Ganapathi died of old age in Chennai on Friday. Hundreds of workers helped the temple architect and sculptor SM Ganapathi Sthapathi in realising the dream of the then chief minister NT Rama Rao to erect a gigantic Buddha statue at Tank Bund. It took five years to complete what is now the world’s tallest monolithic Buddha statue. 58-foot tall and weighing 350 tonnes, the statue stands in the Hussain Sagar. Born in Eluvankottai in Ramanathapuram district of Tamil Nadu, Ganapathi’s contribution to the combined state of Andhra Pradesh was immense and invaluable. Ganapathi Sthapathi was remembered for his contribution in saving 48 archaeologically important temples near the Nagarjun Sagar reservoir from submergence. He was also the recipient of Padma Shri award in 1990. When Nagarjun Sagar dam was on the verge of inundating 48 temples, all over 1,000-year-old, Ganapathi was appointed as the head of the rescue project and he dismantled the temples and relocated them at higher and safer locations. Ganapathi also worked as Chief Sthapathi (sculptor) of the then AP government during NTR’s regime. Telangana Tourism secretary B Venkatesham condoled the death of Ganapathi. Venkatesham recalled the invaluable services rendered by the sculptor to the erstwhile united state. Buddhavanam Project special officer Mallepalli Laxmaiah, in a message, said Ganapathi Sthapathi would be remembered in the history of Telangana for his great contributions like the Buddha at Tank Bund and also saving 48 archaeologically important temples near Nagarjuna Sagar reservoir from submergence.